Come along with me, and let's ride a horse on Camelback Mountain in 1922. You can be the girl from Sunny Tennessee in the photo that I found in the "Arizona, the State Magazine". It's about sunset, and we've been riding all afternoon. It's a nice winter's day, but in Phoenix it's always summertime, so it's not cold at all. Back east in Minnesota, where I'm from, there's snow on the ground. I don't know about Tennessee, but I'd expect that it's warmer here than there? Wow, from here we can see all of the way to Phoenix, several miles away. The tallest building in town is Dwight Heard's building, on Central between Adams and Monroe, and I think I can see it. Can you? There seems to be a lot of dust in the air, I'm not sure. It's so quiet and peaceful up here, so far away from everything. Hardly a sound at all here in the desert, just the rustling of the horses, and the sound of the wind in our ears. I wonder if Phoenix will ever grow all of the way out here? I don't suppose we'll live to see it, but maybe we will. Hopefully some of Camelback Mountain will be preserved in its natural state so people can enjoy it, and not have houses built all of the way to the top, like they're doing in Los Angeles, especially in Hollywoodland. Oops, it looks like we're not alone after all. I see another group on horseback over there. See what I mean? It's already getting too crowded around here! What? No, I wasn't trying to hold your hand, I was just holding the reigns of your horse. OK, maybe I was trying to hold your hand. Look at that sunset! And tell me about Tennessee. 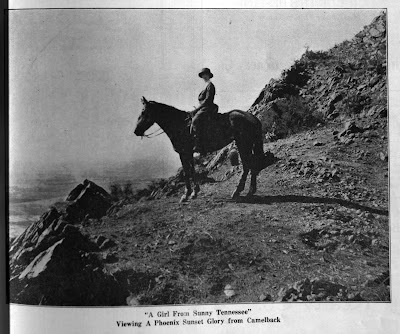 Image at the top of this post: "A Girl from Sunny Tennessee" on Camelback Mountain in 1922, north of Phoenix, Arizona. 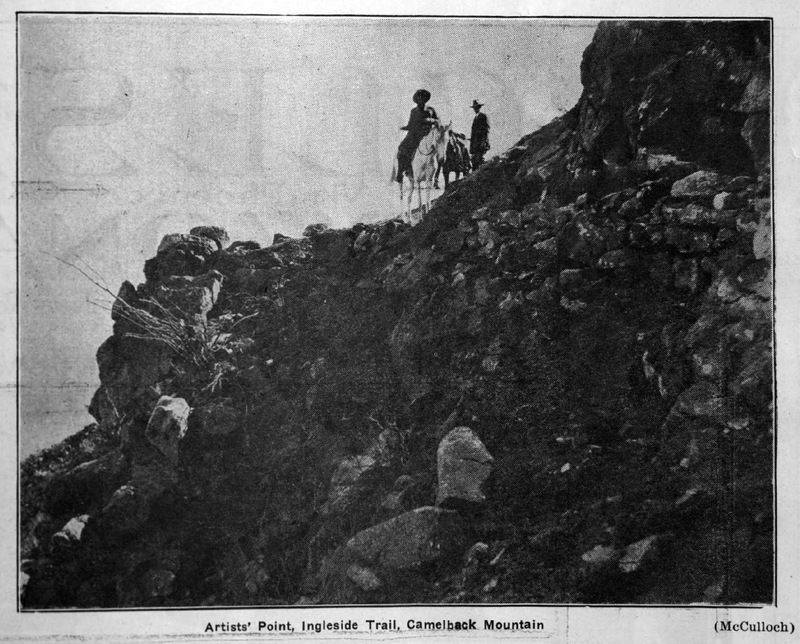 From "Arizona, the State" Magazine, 1922. If you liked this article, please consider supporting history adventuring on Patreon. If you're already a patron, thank you! You make this happen!